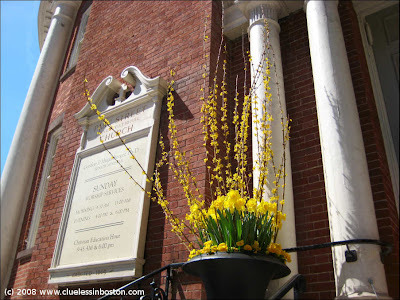 Hint of Spring can be seen in the flowers on the front steps of the Park Street Church. I like the yellow flowers. Love this shot! And the church is cool too ... I used to walk by it everyday on my way to class. Lovely. And you are way ahead of us. Park Street is such a great looking building. One of my favorites in Boston. Glad spring is beginning to show itself! I love the stark yellow with the brick and the white pillars! awesome shot!